Honda has announced a new 2017 Accord Sport Special Edition model. It features a bodykit which includes LED daytime running lights, side skirts, rear spoiler, dual-exhaust system and chrome tailpipes. Inside it gets leather seats with red-contrast stitching. The front seats get “Special Edition” badging as well. Under the hood, is the same 189 hp 2.4-litre engine, mated to either a 6-speed manual or a CVT. The 2017 Accord Sedan and Coupe hit showrooms this Monday with a new Sport Special Edition, ready to continue Accord’s three-year streak as the most popular car in America with individual retail car buyers. Retaining many of the popular enhancements introduced last year, the 2017 Accord will be available starting June 27 at Honda dealerships nationwide with a manufacturer’s suggested retail price (MSRP) starting at $22,3551. The 2017 Accord Sedan and Coupe are available in a variety of trims, with 4-cylinder and V6 powertrains, 6-speed manual and 6-speed automatic transmissions, and a continuously variable transmission. For 2017 Honda is introducing the Accord Sport Special Edition sedan with premium features consisting of leather seats with red stitching, heated seats and “Special Edition” badge. The significantly refreshed 2017 Accord Hybrid, featuring a new version of Honda’s two-motor hybrid powertrain technology with both class-leading power and fuel economy ratings, rounds out the 2017 Accord lineup as it launched earlier this month. 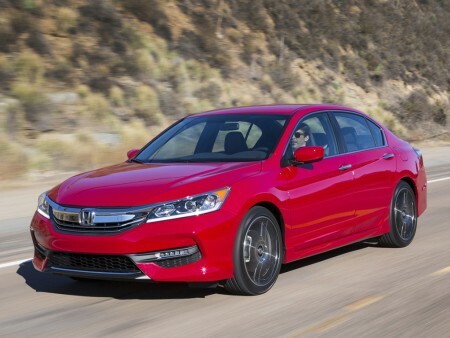 The Accord received significant upgrades for the 2016 model year, including dynamic new styling, a more rigid body, upgraded chassis and upsized wheels and tires on select models. The 2017 Accord carries over the expanded LED exterior lighting and premium features and technologies of the 2016 model, including the available 7-inch Display Audio touchscreen offered with Apple CarPlay™ and Android Auto™, HD Radio®, heated rear seats, and front and rear parking sensors. The Accord also can be equipped with Honda Sensing™, among the most comprehensive suites of advanced safety and driver-assistive technologies in its class. The 2017 Accord Sedan and Coupe, with Honda’s next-generation Advanced Compatibility Engineering™ (ACE™) body structure, has received the highest available crash safety ratings from the U.S. government – a 5-Star Overall Vehicle Score from the National Highway and Traffic Safety Administration (NHTSA) – and targets a top rating of TOP SAFETY PICK+ from the Insurance Institute for Highway Safety (IIHS), when equipped with Honda Sensing technology.